It has finally arrived. After being a fan for over a year of those four Australians I tend to write articles about on a regular basis, they have finally released an EP which is available worldwide. Their first EPs have always been exclusive to Australia pre-worldwide fame, which is fair enough. But at last, their new EP as a signed band has hit stores and download sites across the world. Of course, being a fan of 5SOS, I pre-ordered the EP the moment it was available. This EP is a bit different to most as there are two different physical copy versions. Obviously, I bought the combo pack of the two because there was no way I was going to miss out on any song these boys had recorded. 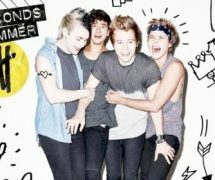 ‘She Looks So Perfect’ – the title track of the EP. I heard this song the moment the lyric video was released on the 5SOS VEVO account and I fell in love. I’ll be honest – I didn’t expect it to sound as it did, but that’s just my assumption off point. This song was written by Ashton Irwin, Michael Clifford and Jake Sinclair and is such a catchy song that has a bit of All Time Low, Blink 182 and such in the influences but 5SOS-ified. It’s a song I literally cannot listen to without wanting to burst out and sing along to but alas, life isn’t a musical and if I were to burst into song on my journey to work, I’d probably get some pretty weird looks. This song was the first single 5 Seconds of Summer have released in the UK and worldwide and has hit number one in over 40 countries, so clearly I’m not the only one in love with the extremely catch chart topper. ‘Heartache on the Big Screen’ – this is where I can finally say to the 5 Seconds of Summer boys that in answer to the question “are we punk rock yet?” Yes, boys, I think you may very well be punk rock now. This song about a relationship being like a bad movie is my current favourite off the EP (although, I shall warn you, my favourite track tends to change on a regular basis). The is definitely more rock than pop and is the kind of song that makes it clear that they aren’t like One Direction – the band they will be supporting for a second time – which parents of fans of both artists keep assuming are the same thing, but if you just listen to an average One Direction song (which I also love, by the way, just saying), and songs such as this from 5 Seconds of Summer, you can definitely see the difference. The heavy instrumented song goes hand in hand with the amazing lyrics written by Ashton Irwin, Michael Clifford, Luke Hemmings, Calum Hood, Dan Lancaster and Mike Duce. Definitely one of the songs I’d play to non-fans as it really shows the boys at their best and fits the image they are reflecting to the world. ‘The Only Reason’ – this isn’t as up-tempo as the previous songs, but it’s still heavy with instruments and has lyrics, written by Michael Clifford, Steve Robson and Busbee, which gets fans slightly teary as they imagine the way the lyrics have been written. This sad love song is one I can definitely see everyone belting their hearts out to at future concerts and is probably the one I’m looking forward to hearing live most at the Where We Are Stadium Tour in which the boys will become the support act for globally successful boyband, One Direction. ‘Disconnected’ – this is the physical copy exclusive which picks the tempo up a bit more compared from the previous track and leans slightly more to the pop side than rock but is still not something you’d hear at a disco. This song was written by Calum Hood, Luke Hood, John Feldmann and All Time Low’s Alex Gaskarth. I was going to say that it sounded a bit influenced by All Time Low and now I know why. As I don’t take a CD player wherever I go, this song is the one I hear the least which saddens me because it’s definitely a song I really like listening to and would make travelling much more enjoyable with this song. Moving onto the second CD (the one with the doodles on the artwork, just so we’re clear.) This CD consists of three songs – ‘She Looks So Perfect (Ash Demo)’, ‘She Looks So Perfect (Mikey Demo)’ and a cover song, ‘What I Like About You’. ‘She Looks So Perfect (Ash Demo)’ – this is the demo version of 5SOS drummer, Ashton Irwin, as lead vocals on ‘She Looks So Perfect’. I would like to take this opportunity to say to whoever said “drummers can’t sing”, this track will prove you wrong as Ashton’s vocals are strong and I’m adamant that the single would still be as successful with Irwin as lead. ‘She Looks So Perfect (Mikey Demo)’ – this is the demo version of 5SOS guitarist, Michael Clifford, as lead vocals on ‘She Looks So Perfect’. As I previously said, I think the song would be equally as successful with Michael as lead vocals. Despite the fact that his voice is lower and a bit huskier than Hemmings (original lead) and Irwin (drummer), I feel like he would still fit just as well as lead vocals. The only downside I will point out is that I’m sad that bassist, Calum Hood, didn’t record a demo for the EP causing me to ponder for hours, night after night, wondering what the track would sound like with Hood as the lead vocals. ‘What I Like About You’ – this is a cover of a song originally brought out by The Romantics and I really like the fact that there is a cover on here as covering songs is how the Aussie four-piece originally started out all those three years ago on YouTube. I hadn’t listened to the original track and I felt that it would only be fair to listen to it in order to review and compare this version to the original. 5SOS have definitely brought a more modern rock twist to the song compared to the original artists who recorded it back in 1979 and is probably something my dad and older siblings listened to. Don’t get me wrong, I really do like the original version now I have listened to it, but in this decade, people my age are more than likely to listen to the 5SOS version. I also like the fact that the boys covered it as curious fans such as myself will try and find the original version and can appreciate why the boys liked it so much that they decided to cover it. 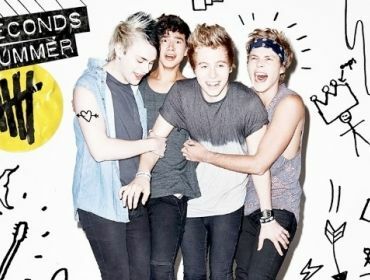 Overall, I blooming love this EP and can say that the year-long wait for the band to release something in the UK was worth it and it’s made me even more excited to see them live for the second time at the Where We Are Stadium Tour where my favourite band supports my favourite boyband for the second time and excited for the album which 5SOS have been working on for God only knows how long and my expectations are pretty high after this EP, but I have no doubt in my mind that they’ll live up to it. 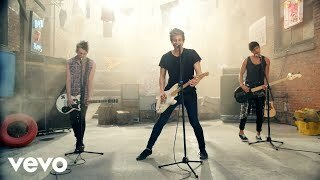 She Looks So Perfect is available to download from a variety of download sites and physical copies on 5SOS.com as well as HMV and other stores across the world. Keep your eyes peeled for my review of them in Wembley Stadium this June.